The inspiration for the design for the Port Weighting Station in the tiny village of Thorlakshofn derives from a maritime reality. 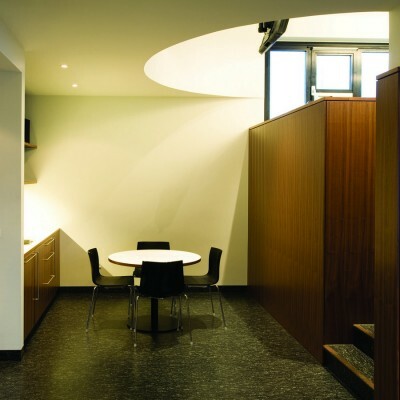 Oval forms refer to an organic and vivacious environment. The orange color of the structure is that of traditional seamans wear. The alerting orange color makes the seamen visible, from near and from far, and enhances their security. The building is on one and a half floors, elevated to provide a view over the mouth of the harbour. A watchplace to follow and pilot boats and vessels sailing to and from. 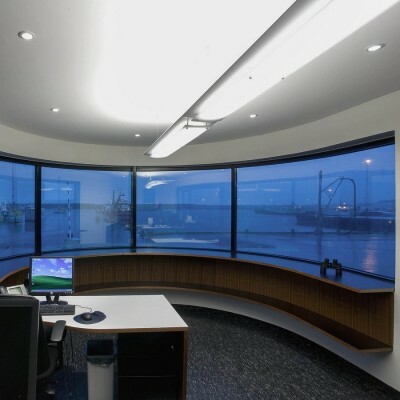 The control room hovers towards the seafront, resembling the superstructure of a vessel. At first glance, function appears to determine the aesthetic; form, color, appearance. But in the Port Weighing Station this distinction between the aesthetic and the functional is diffused, becomes artificial, as the aesthetic value amalgamates with the form, color and function. It is intrinsic. The absence of the superfluous underlines a reality where the man made is defined in terms of the practical and the functional. The structure is clad with aluminium sheets characterised by a rugged surface. The non slippery pattern is that used on iron boards in freezing plants and fishmeal factories,and aboard fishing vessels. The focus for the research was looking into the history of the town Thorlakshofn and the history of the fishing industrie in Iceland. By looking into the coloring, material, texture we were able to combine the feeling of the fishing instrie into the design. 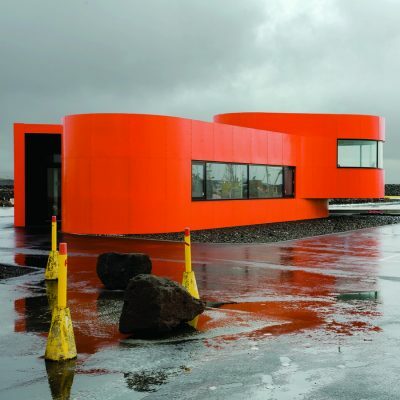 The hardest part was to convince the locals of the color of the building even though this orange color used for the building is well known color in the fishing instruty in Iceland. The client is a harbour in a small town named Thorlakshofn. 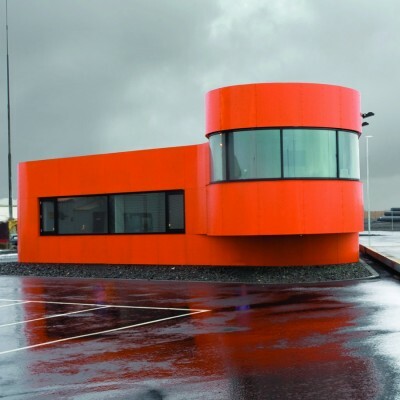 Yrki Architects is an architectural office that emphasises ambition and innovation in architectural creation. Founded in 1997 by Asdis Helga Agustsdottir and Solveig Berg. 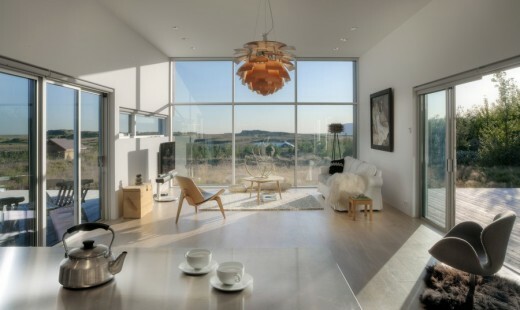 Yrki Architects have fulfilled assignments for both public and private entities and individuals, both in Iceland and abroad. This architecture studio has finished projects in Holland, UK, Canada, Japan, Singapore and Hong Kong and collaborated with local architectural offices. This architecture practice has designed things big and small: museum buildings, front offices, kindergardens, chairs, receptions, freezer storage buildings, bank interiors, extensions, offices, private homes and villas, public spaces, gardens, hotel suites, homes for the handicappped, sofas, appartment blocks for the elderly, an embassy, dining tables, bathrooms, a kindergarten, a nursing home, door knobs, a harbour weight-house and so on and so forth. 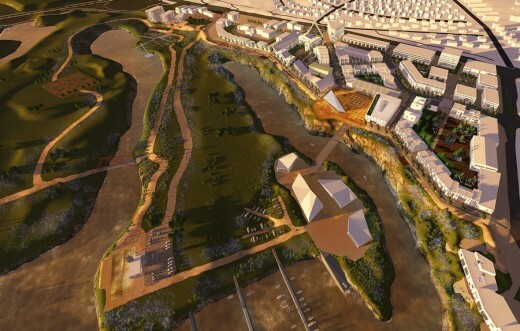 Yrki architects have implemented the demanding ISO 9001 Quality management standard in order to excercise excellent service, efficient communication and solidity in all our work. Our quality system has been approved and certified. Yrki consider it important to integrate the functional and the visual. In that respect the enviroment influences Yrki and the design studio seeks evidence or guidelines in the environment itself. This obviously puts marks on everything that they have created. Yrki has tried to make a critical assessment of the existing environment and show it the respect it deserves. 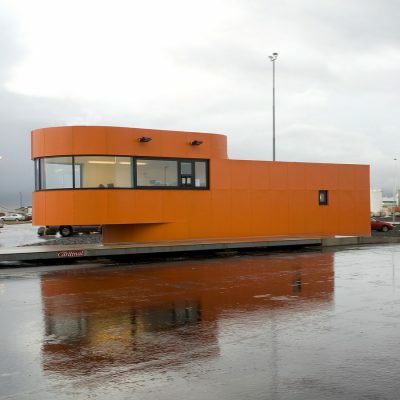 Winner – Port Weighting Station in Thorlakshofn. For Weighting Fish by Yrki Architects is Winner in Architecture, Building and Structure Design Category, 2014 – 2015.